CHAPLIN - The Innovation boys basketball teams’ run of success will continue thanks to a final-minute shot from Malcolm Lewis. Down by one with 40 seconds left, the senior hit the deciding 3-pointer as the Ravens went on to beat Parish Hill 41-37 Thursday night in the second round of the Division V state tournament. Having already beaten the Pirates three times already this season, Innovation were expecting a close game from Parish Hill. Innovation got a collective team effort when it came to scoring. 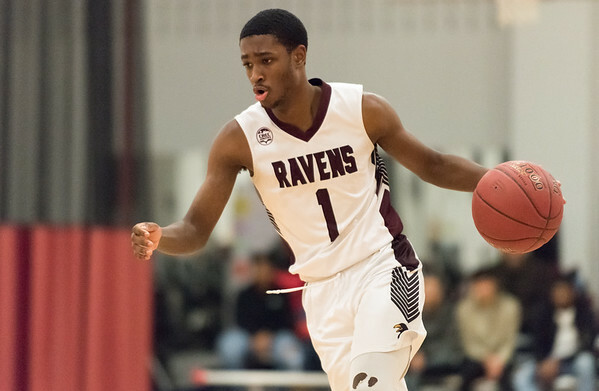 Carlos Gonzalez led the Ravens with 11 points, while Lester Emanuel and Lenny Okonya each added nine. Lewis finished his night with six points. Innovation will now face the winner of the No. 3 Cromwell (17-3)/No. 19 Bolton (10-11) on Saturday. INNOVATION: Malcolm Lewis 2-0-6, Carlos Gonzalez 3-2-11, Lester eanual 3-1-9, Andrea Sterling 2-0-4, Lenny Okonya 4-0-9, Clinton Allen 1-0-2. Totals: 15-3-41. PARISH HILL: Tommy Lehoux 3-1-7, Michael Rahall 2-0-4, Zachary Mihok 3-0-6, Henry Tiemann 1-2-4, Cyrus Sprague 3-2-10, Kyler Zaimoff 3-0-6. Totals: 15-5-37. 3-Point Goals: Lewis (I) 2, Gonzalez (I) 3, Emanual (I) 2, Okonya (I), Sprague (PH) 2. Records: Innovation 16-8, Parish Hill 16-7. Posted in New Britain Herald, Innovation on Thursday, 8 March 2018 21:26. Updated: Thursday, 8 March 2018 21:29.